Accompanying the audio CD is a DVD of one of the Chicago Symphony Orchestra's critically acclaimed Beyond the Score performances featuring a multimedia Shostakovich documentary led by creative director Gerard McBurney. The programme features newsreels and testimonies, including the words of Shostakovich and his friends. Beyond the Score brings to life not only the music, but also the social and political world from which it emerged. 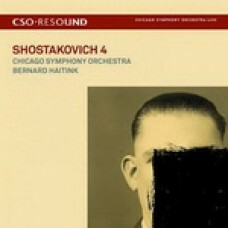 A champion of Shostakovich's music, CSO Principal Conductor Bernard Haitink leads the Fourth Symphony, a dark and emotionally, groundbreaking work. It lay dormant, unperformed, for 25 years after its completion but now this stunning symphony is recognised as one of the composer's boldest and most brilliant scores.